San Francisco is expensive, and I should know that being a native resident of this city my entire life. Trying to be a penny pincher is tough, especially with the rising costs, from the gas I buy to the food I eat. I thought I'd show you my favorite places to score great discounts and free stuff. Many require you to be registered as a member of a program or be an affiliate. Save 47% each way. Golden Gate Ferry passengers pay $8.25 cash fare for a one-way ride on the ferry boat, but why the hell would you want to pay that kind of insane price? Instead, use a Clipper card and you only pay $4.40 each way, a massive 47% savings. 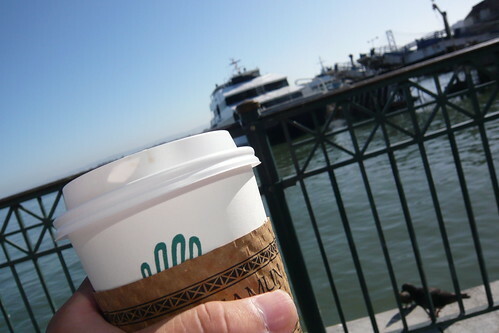 Even if you paid $5 for a Clipper card, you still save money after a round-trip on the ferry. Free parking at Pier 39 for two hours. When I want to go to the Wharf and not experience getting groped on the crowded F-Market streetcar, I take the car to the Pier 39 garage. Bring your AAA card to the California Welcome Center and you get a coupon book; tell the person at the counter you parked in the garage and score a free parking voucher. It's a $14 savings. $8 parking at Mason & O'Farrell Garage. But it gets sweeter than that... it's $8 for up to eight hours. Parking at the lot starts at $2.50 for the first 20 minutes, and other private lots around the downtown area can sometimes charge even more, so just being a student, staff, or faculty, you get the best parking in town. 10% off Westfield Mall "food emporium" vendors. If you want good food, you just show your SF State ID at the food court and score a 10% discount. Most vendors accept it, except the gelato place. Steep discount on computer software at SFSU Bookstore. Just bought a new computer and need Office software, or have an old computer needing a new operating system? The campus bookstore gives generous discounts on the most popular software and operating system updates. For example, I got Office for less than $50 when it costs over $100. Only downside, the Office software is a bulk license, so you don't get any fancy box or instruction booklets. Computer hardware discounts for Apple products. SFSU Bookstore and the Apple store gives discounts to students for buying Apple desktops and notebooks. Staff and faculty may be eligible for discounts as well by showing their ID, but may also get better deals through their union. Average savings is $100 per computer, may sometimes include a free iPod. Save up to 40% on transit costs to work. Your employer may be participating in a commuter benefits program. If you take public transit or park in a parking lot that accepts commuter benefits, you could get your tickets, passes, and parking permits pre-taxed from your payroll. I save at least $140 a year by buying my passes pre-taxed. Try the calculator to see how much you might save. Free bread. If you register for one of their loyalty program cards, you get a free loaf of bread every month for 13 months. Each loaf costs $3.99. I buy some cheese and tomato sauce to make mini pizzas. $2.50 for a bag full of donuts. It's a little trick, buy the second smallest size offered (about $4), and when you are done, keep the bag for your next trip (I suggest shaking out the sugar in the trash before neatly putting it in your pocket). When you come back with the old bag, they'll refill it as much as it can hold for $2.50. Costco (at least the SF location) has coupons for 2-1 pound boxes of See's for around $23. The coupons are just gift certificates (with no expiration), and they'll let you either buy a 1 pound pre-packed box or pick your own 1-pound mix. My east-coast relatives love it when I bring them a box of "local" chocolates and I save a few bucks.